Formed in 1992, the Unified Jazz Ensemble (UJE) is committed to entertaining and educating diverse audiences. Based in Annapolis, Maryland since 1996, the UJE was previously located in Iowa and Arkansas as the flagship ensemble for the highly successful “Rural Residency Arts Initiative” funded by the National Endowment for the Arts. As NEA-sponsored artists-in-residence, the members of the UJE served as faculty and visiting clinicians at over one hundred primary and secondary schools, colleges and universities. The group’s international work included a 1993 tour to Japan and South Korea under a Department of Defense performance initiative. In the U.S., the UJE has played at numerous jazz festivals, performs in the schools, and has been featured on radio and television. 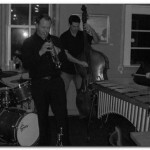 They have shared the stage with jazz greats including Milt Jackson, Charlie Byrd, and Bobby McFerrin and performances for numerous arts councils. 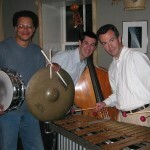 Performances include: Maryland Public Television, July 2006; Smithsonian Jazz Café with Mundell Lowe, August 2006; Music Center at Strathmore, October 2006; Clarice Smith Performing Arts Center, June 2007; Gettysburg College, November 2007. The UJE has made seven recordings, all featuring original compositions, and continues to produce music that is enjoyed in live performance and over the radio. After more than a decade as a group, the UJE’s goal is to present jazz in an enlightening and engaging manner to audiences of all ages.